A relative newcomer, Pay My Repairs is a broker agency of vehicle service contracts offered by several different providers. As an agency, they are able to access a wide array of plans for their customers. Pay My Repairs sells contracts in most states and offers a “best price” guarantee. Coverage is accepted at dealerships and ASE licensed mechanices and all plans are backed by an A rated insurance company. Based in Wilmington, Delaware the company claims a high level of experience and knowledge when it comes to extending vehicle service contracts. There is not a lot of feedback online about the company at this time although overall – reviews from past customers tend to be positive. The company appears to put considerable effort into creating a “friendly” sales and customers support experience. 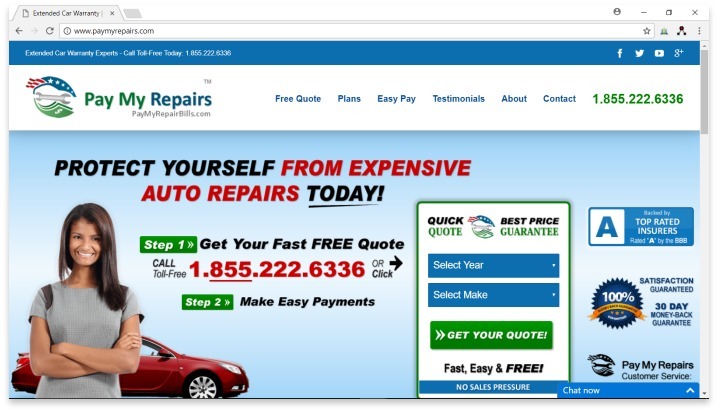 PayMyRepairs.com strives to protect their customers finances by offering affordable, monthly payments for extended contracts on vehicles. Although not very well known, Pay My Repairs is slowly becoming a major player through slow steady growth and an obsession with friendly sales and customer support. As always, we recommend you read the actual contract before purchasing. Extended service contracts can spare you from major repair expenses but only those which are covered by the agreement. Have you had an experience with this company? Please share your Pay My Repairs reviews by scrolling further down on this page.